I am SO sorry that this took so long, but I wanted to make sure that I had photos before I posted the recap. Recaps are just that much more exciting with photos, anyone want to be our personal race photographer? That's the one downside of us both doing this, we can't take photos of each other! Saturday morning we woke up semi-early to pack (yes, we do wait until the last minute) and bring Bernie to boarding. We had some time to kill before we could check into the hotel or go for a test swim in the lake, so we decided to drive some of the Seneca7 relay course. Mike wanted to show me the hills he had to run up on his second leg and let me tell you they were killer! We then checked into our hotel and a little while later made the half an hour drive to Keuka College. The lake had lifeguards from 1-6pm and since we went without wetsuits we wanted to get used to the lake temperature. We weren't the only ones swimming at this time, but we were the only ones without wetsuits! The lake temperature was fine and that put our minds at ease for race day. After changing we went to packet pick-up and walked around the small expo for a few minutes. We weren't planning on buying anything so we headed back to the hotel, went out to dinner and relaxed before bed. I didn't sleep that well but not completely horrible. The alarm went off at 4:50am and we were dressed, packed and out of the hotel by 5:15am. We had picked up some drinks and breakfast items the day before, so I was able to have my toast and peanut butter on the drive to the race. When we got to the college we headed to the transition area first and set up our areas. We were in different rows because we were in different waves for the swim, they kept everyone racing together in the same transition rows. Didn't need to worry about how to rack it this time! After that we went to get body marked. I haven't mentioned yet but my number was 666. Not that it bothered me that much, but some people made slight comments about it. We needed to have our thighs/knees, arms and one hand marked with our numbers (I'm not sure why our hand needed to be marked) and one calf had an "S" (for sprint) and the other calf was marked with our age. We finished setting up our transition area and hit the bathroom a few times. Even though Mike's wave wasn't until 8:15am and mine wasn't until 8:30am, the transition area closed at 7:15am. The first wave, for the intermediate distance, was at 7:30am so we were able to watch a few waves start the swim before it was our turn. Sorry dude I stole all your photos and why it says 2011 don't ask me! Before we knew it, we were walking down the hill to the swim holding area. Mike's wave, U19 males, U19 females and 20-34 males, was called and he headed into the holding area. While waiting for Mike's wave to go off, I felt like he had been in the water for forever. Later he told me that the other racers were wondering why they had been in the water for so long. Finally, you heard the announcer say, "10 seconds to the start" and the horn sounded! I could only see Mike for so long, they all looked the same in their white caps, but I wondered if he might be out of the water before I even started. A few more waves took off and then my wave was in the holding area. My wave was only 20-34 females and a few of them commented on how I was brave for not wearing a wetsuit. I told them that the water temperature wasn't too bad and when we got in the water, they agreed with me. Then, it was my turn. The horn sounded and we were off. I managed to not get kicked in the face during the swim and I just focused on sighting. 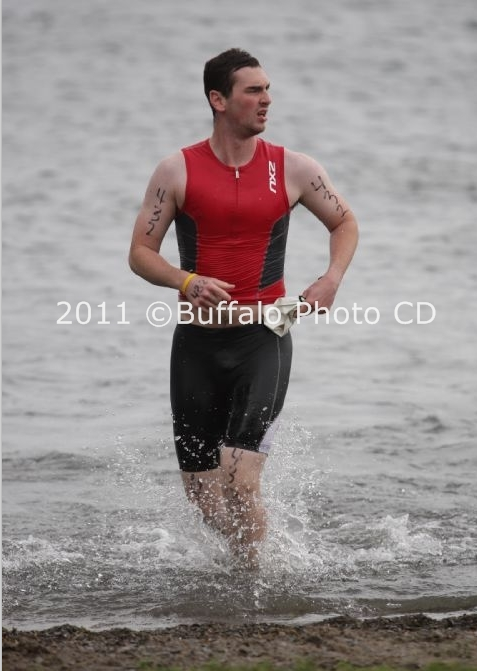 The lake was pretty choppy on race day, which was unfortunate, but I just kept powering through the water. 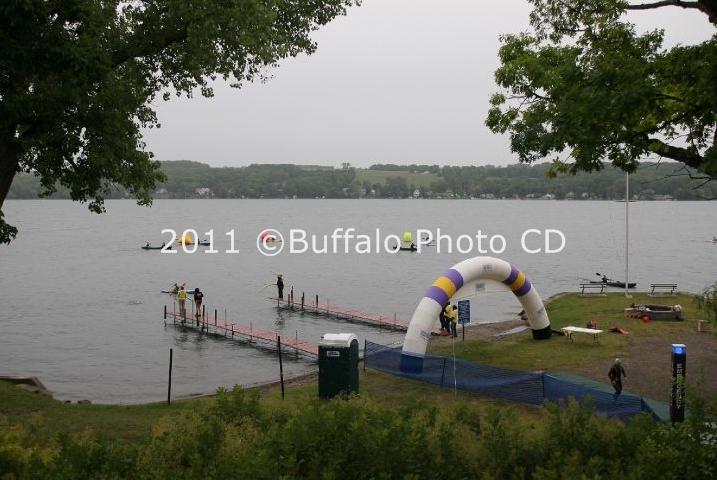 I found one girl to "draft" off of (you are allowed to draft during the swim) and we kept swimming by each of the buoys. Before we even rounded the last buoy, I saw yellow and silver caps! I was passing people from the two previous waves. The last 200 yards were the worst because you were swimming right into the current and the swim exit was really hard to sight. 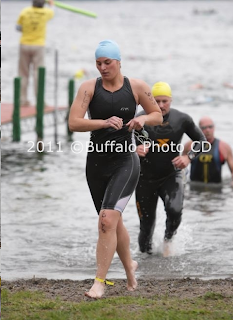 I just focused on keeping up with the girl ahead of me and finally made it out of the water. I had a feeling I was one of the first to finish the swim in my wave and I was right! 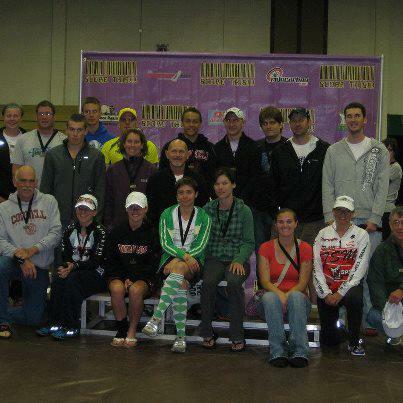 I was third in my age group (25-29) and fifth in my wave. 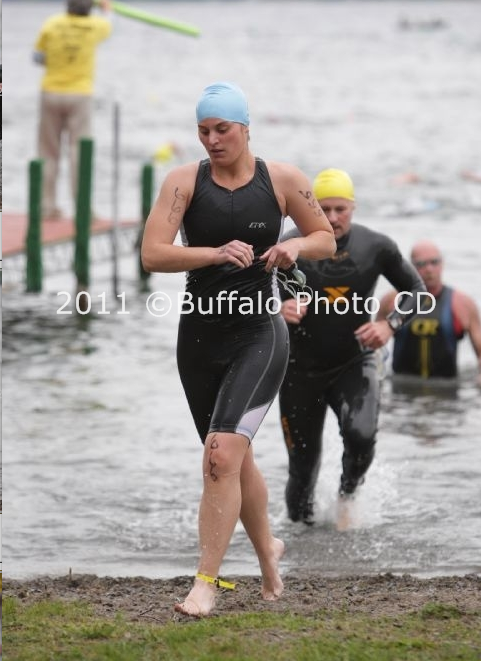 I was shocked to see that we both took over 15 minutes for the swim, but it was because of the wind and the waves. After the swim was over, we had to run across the beach and up some stairs. This was a no wetsuit strip zone, which didn't apply to us. Then you ran across the street into the transition area. Not so fun running up those! As soon as I got to my area, I put my helmet on and started my watch to locate satellites. I dried off a little bit (obviously not as much as Mike) and by the time I got my socks and shoes on my watch was ready. 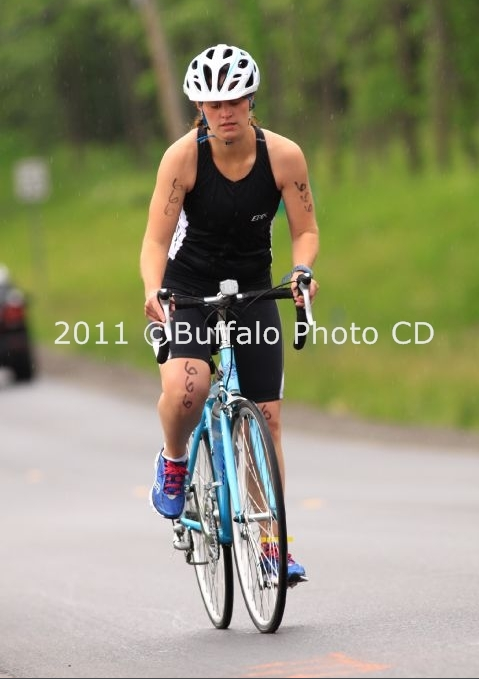 I grabbed my bike and ran out of the transition area. Once I got to the mount line, I got on my bike and hit the road. 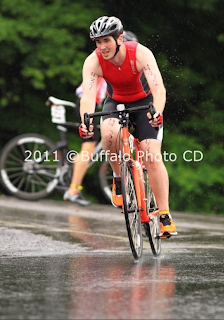 Unfortunately, as soon as I started the bike leg it started to rain. It wasn't bad at first but it was coming down pretty decently for a little while. I knew that there was going to be one killer hill and I hoped that I had hit it around 4 or 5 miles. I definitely got passed by some of the slower swimmers in my wave on this leg, but I didn't let it bother me. The one thing that I didn't like was that people were passing me on the right! I definitely was over far enough that they could have passed me on the left like you are supposed to, oh well. Eventually I saw bikers on the other side of the road and I thought that I might be able to see Mike! We had looked at the courses online, but the bike leg was the most confusing. I kept my eye out for him and kept spinning along. Finally, I saw him! I gave him thumbs up and he said something to me (I thought he was asking if I was alright) that was encouraging and we continued on our separate ways. There was a downhill right before the turnaround that was a little bit scary because of the rain. I just focused on not falling over and then hit the turnaround. 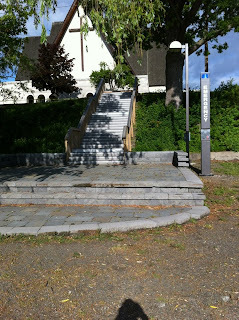 Unfortunately, that's when I had to go up the huge hill! My pace slowed to above 6 minutes, but then I managed to pass two people! It doesn't matter that one of them was fixing his tire and the other was running with his bike, passing is passing. Almost done with the bike leg! I picked up speed the last three miles, clocking some of my fastest miles, and then turned the last corner back to the dismount line. I got off my bike and ran back into the transition area. I had some trouble racking my bike, I was trying to push it in the grass instead of lifting it into the rack, but then I took my helmet off, changed my watch settings, put on my spibelt with my bib and grabbed my energy gel. Mike's official time isn't accurate. He was all set to run out of the transition area for the run when he realized that he didn't have his spibelt on with his race bib. He turned around and went to go get it, but he must have already crossed over the timing mat. This made his transition time shorter than it really was and his run time longer than it really was, oh well he knows for next time! As soon as I left the transition area, I set my watch and started to open my energy gel. I knew that there were a few water stops on the run course and I took my gel before I got to the first one. My legs felt like bricks! I knew I was running pretty fast for the end of a triathlon and I just focused on getting to the turn around. 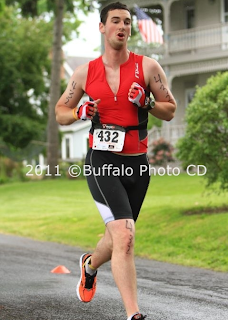 I also started to pass people again and I ran by a few people in my age group. Mike did amazing on the run! I saw Mike right around .5 miles and I told him that he was almost there! I was so excited for him because he was so close to being a triathlete. I took water at the first two water stops and then got to the turn around. We had been told before the swim leg, while we were in the holding area, that there would be a cone where we needed to turn around. Instead I saw a guy standing in the middle of the road and as I turned around him I said, "so you're the cone, huh?" He didn't say anything, he must not have liked my humor. I skipped the third water stop and kept pushing on. I was determined to keep all of my paces under 9 minutes per mile (which I did) and as I went through the last water stop I knew I was almost there! I could smell people cooking bacon, which smelled disgusting to me, and this guy passed me and said, "keep up the good work girl". As I got to the last .3 miles I was so happy! I saw Mike right before the finish and he cheered me on. I ran up the grass, through the finish line and I was done! We had no idea what our finishing times were, because the only clock they had was for the first wave, but we were both really happy. Mike's actual run leg time, according to his Garmin, was 24:44. He said he felt great during the run! Overall, we are really happy with how this went. Of course there is always room for improvement, i.e. biking and transitions, but it was a great first triathlon! The post-race festivities were AMAZING, the food was really good and we got first time multi-sport finisher's medals (yes we did the duathlon but the triathlon felt like the real deal). Now you really didn't think that would be our first and last triathlon of the year did you? 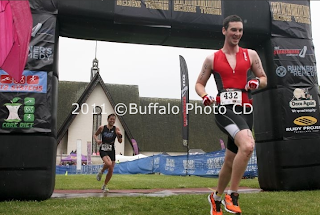 We decided, in a spur of the moment way, that we want to do one more sprint triathlon this year. Since we won't necessarily be training for it, we are doing marathon training with some cross-training, a sprint seemed like the best decision. Which one is it? 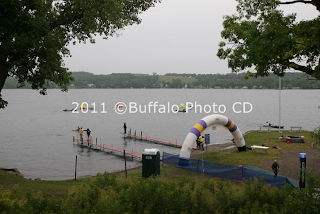 The Skinny Man Sprint Triathlon in Skaneateles, New York on September 1st! It is going to be hilly, but it is going to be so much fun! 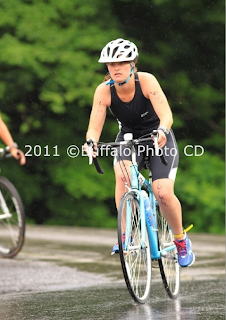 Great Job on your first Tri! Glad you guys had a blast! I love that you got to do it with your husband! Thanks Alex!! It is really great to be able to race with him! Congrats on your first tri! That's so awesome! Thanks Mandy! It was a lot of fun! Great recap, Jamie! Loved reading about the race!! Tri is so much fun. :D You both did a great job! 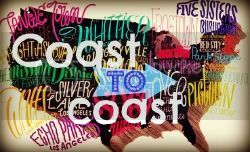 Very nice recap Jamie! 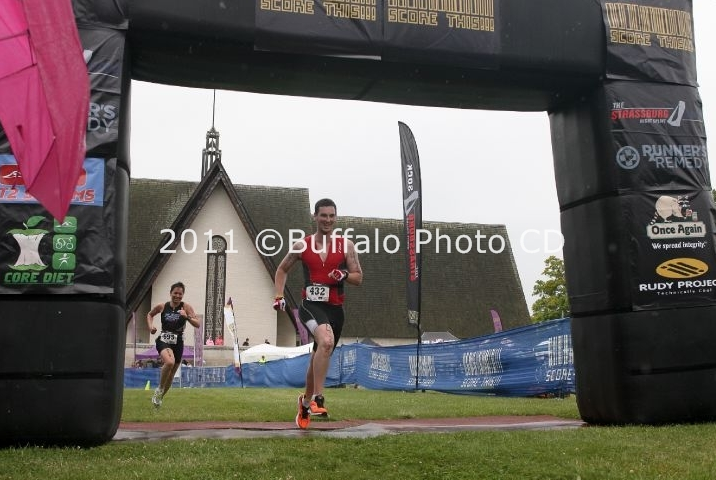 These race photos of both you guys are great with both of you looking so strong and focused in all of them. Thank you Suzanne!! I know I was surprised at how serious we looked! I never notice the photographers though so that might explain it. Awesome recap!!! Great pictures and your time was fabulous! Love all yours and Mikes photos, you both did so good. You'll have to teach me everything you know! Great pictures of you guys in all the events!! You should get some of them- I especially like the closeup one of you running, and the head-on shot of Mike biking(where you have 'doing great!' under the picture! congrats again! Thank you! We probably won't buy any since they are a little expensive, but we'll see. Awesome, awesome, awesome!! 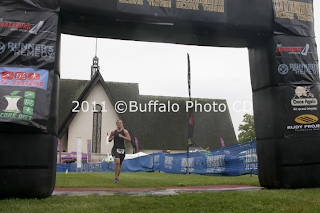 Love the photos...they are amazing and really show your all out effort in this race!! Congratulations on your first tri both of you!!! Woohoo! Awesome job:) Love all the pics. Those wet roads would make me nervous on the bike. Looks like you had a great time! I was only nervous going down the biggest hill, other than that it was just an annoyance. Luckily it let up a little during the run. 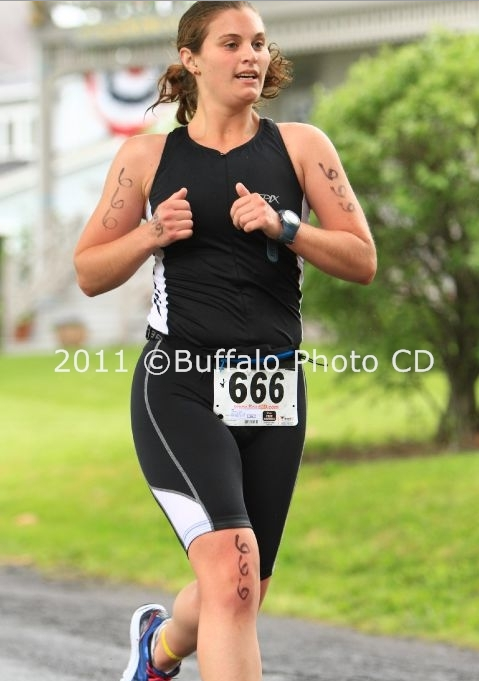 Awesome race photos! You two look great! Congrats on the tri! Very well done! Jamie I am SO SO SO proud of you! I have to say that this little line "I was so excited for him because he was so close to being a triathlete. " made my eyes well up a bit. It's so wonderful that you two are able to compete together. 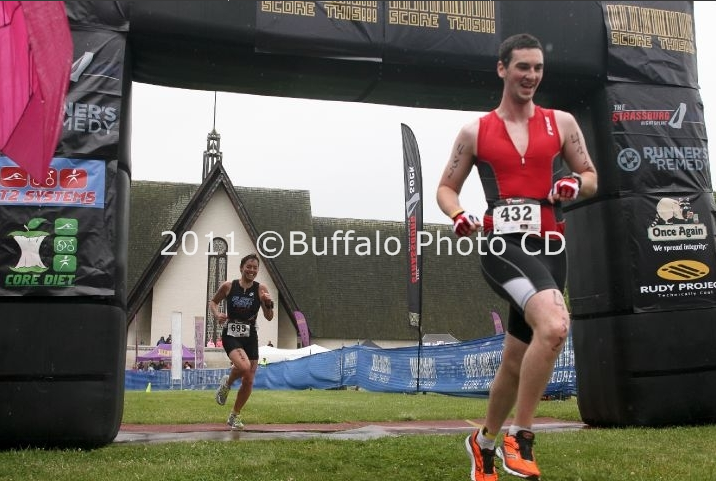 You are both triathletes now!! :) Kudos!! I love Skaneatles (spelling?)! Will you be swimming in the lake? Congrats to both of you! I've never been there and I always pronounce it wrong, haha. We will be swimming in the lake, hopefully it is warm enough to go without wetsuits again! Thanks for great race recap! 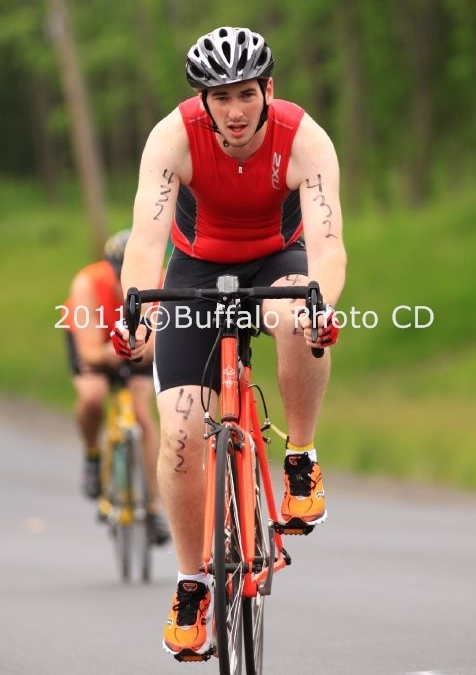 I'm doing my first tri next month so its great to hear others accounts! Great job to you and mike! Way to go to both of you!! Sounds like you had a great time too which is always a good thing too! Thanks for sharing your recap! And so awesome that your husband did it with you!